Complete: Blockfolio updated the status of "XBTS decentralized exchange"
@blockfolio The world&apos;s most popular Bitcoin & cryptocurrency portfolio tracker. Thank you everyone for your participation in the #blockfolio and making it successful! TOP 3 WINNERS! Second round results of blockchain voting! Second round of blockchainvoting has officially concluded at 15 December 2018! Third round has already started! We would like to thank everyone that participated! Congratulations for winning the free listing on XBTS and BitShares exchanges! TOP 3 WINNERS! First round results of blockchain voting! First round of blockchainvoting has officially concluded at 1 December 2018! Second round has already started! for winning the free listing on XBTS and BitShares exchanges. WIN FREE LISTING AT DEX EXCHANGES. Registration is open! have developed a Blockchain-based fair voting technology. Blockchain voting! 3 winners in each round! Your choice will be recorded into the blockchain! The new decentralized technology of XBTS blockchain exchange opens the doors for Waves tokens which want to expand the geography in BitSharesnetwork. 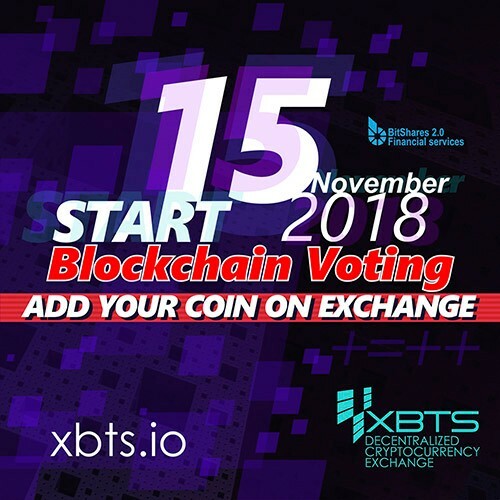 XBTS crypto currency exchange is a fast blockchain bridge between popular decentralized platforms Waves Dex and BitShares.